When running Ubuntu 16.04 on OpenStack, cloud-init fails to properly configure the network from network_data.json found in ConfigDrive. When instance boots, network is configured fine until next reboot where it falls back to dhcp. When debugging, if this line in stages.py  is commented, we can see that cloud-init initially copy the /etc/network/interfaces file found in the configdrive (the network template injected by Nova) and isn't using the network config found in network_data.json. But later it falls back to "dhcp" and rewrites yet again the network config. 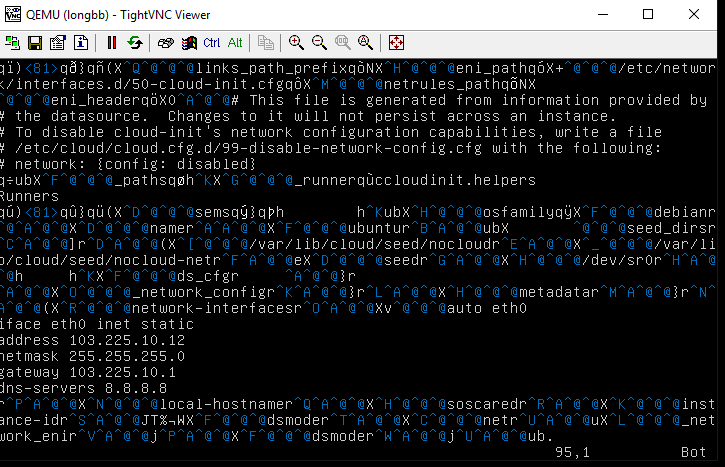 Manually forcing "net" dsmode makes cloud-init configure /etc/network/interfaces.d/50-cloud-init.cfg properly with network config found in the ConfigDrive. However no gateway is configured and so, instance doesn't respond to ping or SSH. At that point, I'm not sure what's going on and how I can debug further. * Logs, configs and configdrive can be found attached to this bug report. My cloud platform is OpenStack Mitaka on RDO (CentOS 7.2) with XEN hypervisor and config_drive option. On my guest system is CentOS 6.7. Starting cloud-init: Cloud-init v. 0.7.5 running 'init-local' at Wed, 18 May 2016 08:19:18 +0000. Up 22.67 seconds. Starting cloud-init: Cloud-init v. 0.7.5 running 'init' at Wed, 18 May 2016 08:19:18 +0000. Up 23.39 seconds. Starting cloud-init: Cloud-init v. 0.7.5 running 'modules:config' at Wed, 18 May 2016 08:19:20 +0000. Up 24.60 seconds. Starting cloud-init: Cloud-init v. 0.7.5 running 'modules:final' at Wed, 18 May 2016 08:19:20 +0000. Up 25.41 seconds. Consumption of network_data.json was introduced in trunk at some point before revision 1212; you'll need to update to use a more recent version of cloud-init to get it working. Hi, anyone listening I'd like test of my ppa at https://launchpad.net/~smoser/+archive/ubuntu/cloud-init-dev . * you can add a local user with a password interactively here to allow you back in if it fails to get neworking. And if you see any WARN in logs, please attach them. This was fixed in yakkety at 0.7.7~bzr1227-0ubuntu1 . It will be sru'd sometime soon. This bug was fixed in cloud-init at revision 1225 and was sru'd to xenial under bug 1595302, but unfortunately not even marked in that bug. So anything newer than 0.7.7~bzr1245-0ubuntu1~16.04.1 in xenial should have the fix. but using 16.04 can not setup the network.Can you help me to check? Can not fix,....Can you please help to try? Then i run the cloud-init,Hostname and password can setup,But network is fail. Is some in put setting wrong or cloud-init gen the format is wrong? could you please open a different bug? and link to it from here? This bug specifically handled 'config-drive' (the openstack disk format rather than 'NoCloud'). I have reproduced your issue. configure the network from network_data.json found in ConfigDrive. where it falls back to dhcp. falls back to "dhcp" and rewrites yet again the network config. so, instance doesn't respond to ping or SSH. Looks like the problem that Long stated in the post #8 persists and it wasn't fixed in 0.7.7. I perform cloud image configuration using the 'network-interfaces' key in meta-data file. First boot goes smooth, I detach the iso file and reboot and the VM falls back to DHCP. I already have net.ifnames=0 in my kernel parameters. I'm using version 0.7.8 and it doesn't seem to be fixed there. P.S. You've opened the bug in #13, but it looks like it's a different bug so i decided to write here. I'll open a separate bug if it is needed. I do have the same issue . This still affects me with cloud-init version 0.7.9 and Ubuntu 16.04.03 Lts. It's probably best to open a new bug on this. If you wouldn't mind doing so with a clear reproduction in the form of "what happened, what I expected, observations made" that would be very helpful!